Sometime in August 1984 (I remember it was a Friday because of subsequent events) I was reading a book by Jan Morris on Wreck Beach in Vancouver. Jan wrote about a journey across Texas to the Mexican border. I was so hit by nostalgia for Texas that I went home and told Rosemary, "I am going to Texas on Monday. I am going to visit my dentist friend from St Ed's, Stephen Burdick who lives in Houston." I called directory assistance for Houston and remembering Stephen’s middle name, Allan, I asked for Dr Stephen A. Burdick. Within minutes I was talking to my frien and who said he would drive me to our old school in Austin. While I have always tried to keep in touch with the people of my past, it can be difficult to do so with the stress of living and making a living in the present. On one extremely hot Houston evening, Stephen Burdick and I met with four or five more of our former classmates (ones that lived in Houston or nearby) poolside at the Holiday Inn. I was shocked by the surprise of seeing boys that were men. These were men whom I had last seen as boys 23 years before. One of them, John Arnold in his white short sleeved button-down shirt (and tie) looked like Gerald Ford. Maurice Badeaux, another of classmates and also with Arnold a former roommate) whispered in my ear, "He's a spook with the CIA." Sixt three of us had graduated from St Ed's High School in Austin, Texas in 1961. Some of us were boarders. Others were day students. We mentioned those who we remembered. Some had not finished with us in 1961but had left some impression. The Anglos had a bit of a problem remembering the Garzas, the Garcias and the Gonzalezes. We almost forgot the Hungarians, the two Katos (Csaba and Nicholas) and Istvan Rozanich. One name we all remembered was John "Bear" Ryals. He was a big guy. He was a quiet, soft spoken big guy who in my memory of him (he attended St Ed's the full four years) never lost his temper or beat up anybody. "He died in Vietnam," they all said. I remember thinking, "Ryals died in Vietnam." All those articles I had read in Time, all those body counts I had read in the newspapers had meant nothing until now. I knew someone who had died in Vietnam. Off and on I have found other classmates and I correspond with some, frequently. If I am going to be really honest I can affirm that in the 48 years that have elapsed I have forgotten many of those 63 classmates. I can also affirm that I may have been shy, rude or a nerd because I made few friends in those four years. The few that I made, like Dr. Stephen Burdick, were that kind of friendship where the communication barriers of the 60s and the physical distance between Texas and Argentina almost guaranteed a fade into oblivion. It took Jan Morris to put that first spark of interest. As I prepare for he exciting prospect of a first ever all classes (1925 -1972) reunion this June 12 (to 14) I wonder why I am excited. A four year stint as a boarder in a marginally strict Catholic school leaves more impressions, obviously (to me, only now!) than sharing the deck and the captain's table with other old people of my age on a cruise ship. God forbid that I will be ever caught on such a deck! My earth-shaking revelation is that those four years cemented a bond that I was not aware of. 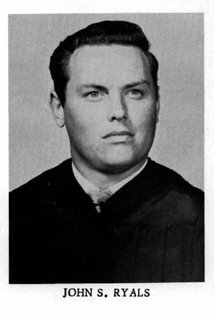 One classmate, Lee Lytton III who hailed from a Sarita, Texas, a hick town (my opinion then) tormented me for a few years by calling me Monk. It seemed that my nose in combination with my jaw line produced a simian profile. Lytton was suave (I should have suspected then that there was more to Sarita than I knew), had a wonderful sophisticated sense of humor and in spite of his glasses seemed to be popular with girls. He could dance. I couldn't. Lytton was a member of the cheerleaders. From my vantage point in the school band I could only lust after Judy Reyes, while Lytton could hold her hand and jump up during our not too frequent touchdowns. We now communicate freely by email. I can sense the bond of those shared four years and I look forward to seeing him in June. Like everybody else, Lytton said, John Ryals Died in Vietnam. Trying to find a classmate by Google and other methods has been frustrating but also exciting when I find someone. Some of us are technology impaired and "we don't do email." For those I used on-line white pages and Skype. Our school yearbooks, the Edwardians, thankfully noted our middle name initial. That helps. But many of those names lead nowhere quickly. As an example, my search for William B. Schieffer reached a dead end at a disconnected phone number in San Marcos, Texas. Before Schieffer and I became friends (he was a day student so he could drive a car. This was a privilege we all were most jealous of.) he forced me to the floor, sat on top of me and said, "If you tell me one more time that my Nash Metropolitan looks like a bath tub I will beat you up." I called Charles Rodgers who lives in Tyler, Texas. Rodgers had no recollection of me even though we had both been borders. He was tall, good looking and he liked to smile and sing. I asked him what he did. "I am in the funeral business." I threw some names at him. My ears perked up when he said, "Ryals called from, I believe it was Massachusetts. He told me he was coming my way. But he never showed up." This was a ray of hope after months of going through all kinds of war dead lists from the US Army, US Navy, Air force and Marines. I never got anywhere even though John Ryals's middle name was the most unusual Shelly. I tried a site called Classmates.com. Once you sign up you can see a pretty detailed list of classes. I find many for 1958-1962. The deal is that you cannot communicate (or get a confirmation that your message was received) until you pay. Once you pay you become a Gold Member. This sounded like a racket so I did not pay. To my pleasant shock I found John S Ryals in that list. Best of all he was a Gold Member. This would mean that if I emailed him and put my person email in the message, he would be able to answer back without me having to pay. Consider the Kismet of the situation. Of all the St. Ed's classmates of mine in the year 1958-1961 the only Gold Member is Ryals. I sent my email. The reply, amply proves that truth is most definitely stranger than fiction. First I should tell you this is not John it is his wife Sarah. I usually do the computer stuff. It is good to hear from someone that attended St Edwards. John has been wondering about reunions for many years, but never knew how to find out when they are, or who to contact. If you read John's write-up you will know that he is living in Massachusetts. He stayed up there after getting out of the Navy. He has 3 kids 1 boy, 2 girls, and 7 grandchildren, 4 boys 3 girls. Yes John had quite a problem while in the Navy, I did not know him then. I don't know where they were going but off the coast of Naples the destroyer he was on was struck by an aircraft carrier. It took several hours to get him out, 10 cases of toilet paper saved his life. They airlifted him to the aircraft carrier, operated on him, and then he was in the hospital in Naples for 3 months. While the ship was being repaired the crew restored an orphanage in Naples. We are in Naples, FL for the winter, will start back to MA the first part of April. John lives on. I don't know if we will make the reunion, we have to go to Savannah, GA. One of the grandsons is into gymnastics and has a competition in Savannah in June. Right now John is out with the guys at the rec hall playing poker. I will make sure he gets your email in the morning. If you want, you can email John back at this address. Talk to you later. Magazines and newspapers of yore, BD (before their decline) used to run articles that went through predictable cycles. 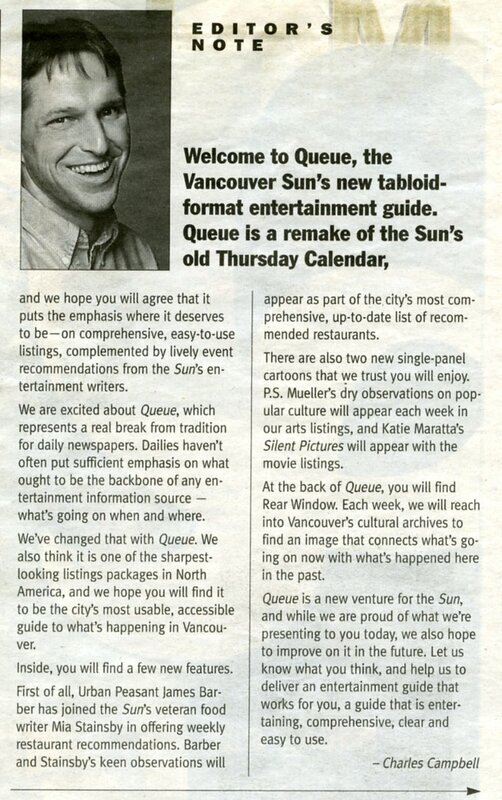 One of my favourites was when editors would assign young writers to drive a cab and then write about the experience. Another was "Where are they now?" This later theme worked especially well when one of the "them" had faded from our memory. The two men I cite here in the "where are they?" have quite a few things in common. For one I photographed both men in March 1990 for a business magazine called Equity. Both men were developers. One of them (Michael Audain) was already very wealthy. The other, Bob Rennie (here with his two children) was on his way. Both men are around. Both men are famous. One of them is of that rare breed, a philanthropist of the arts. In 1974 Rosemary (the pioneer of our family) told me, "I think Mexico right now is unstable. I don't see much of a future for us and for Ale and Hilary. We should move to Canada." Rosemary was not only a pioneer but practical, too. We had decided to send all of our belongings by a moving company but when it came to traveling to our destination, Vancouver, Rosemary suggested we buy a roof rack for our arctic white VW beetle. 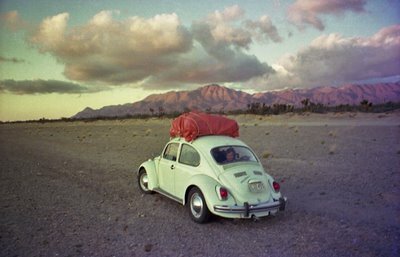 A year before we had driven all the way to San Francisco using the newly opened Baja California Highway. This time around we drove up the west coast of Mexico through one of the most spectacular and dry deserts of the world, el Gran Desierto de Altar which is part of the bigger Sonoran Desert. We saw volcanos so small that our sense of scale became warped. 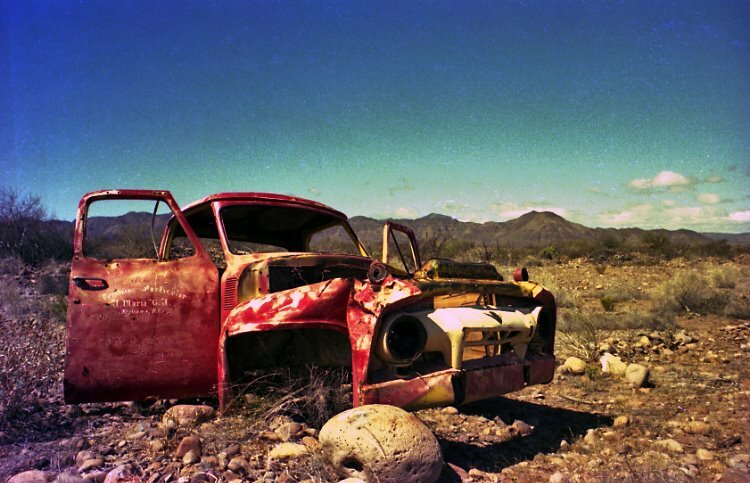 We saw the skeletons of cars and trucks that had not made their destination. Our home was the off white VW with its orange tarp. At the Desierto de Altar all I remember was that it was very early in the morning and the mountains (that sense of scale again) were either close and small or far away and large. We really could not tell. Even though the girls were tired and sleeping I stopped and snapped this picture of Rosemary and Ale. I took the picture using Kodacolor II with my decidedly unsharp Pentacon F with its Tessar F-2.8 lens. 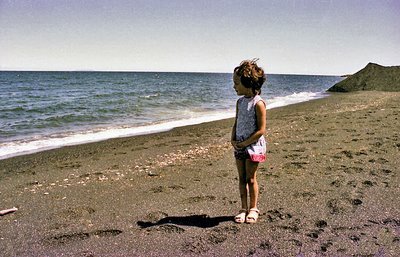 If you compare this picture with the others you will note that the negatives have suffered emulsion breakdown since 1975 and I am unable to correct the colour across the board. It could have been worse if I had not remembered that the VW was not white but a curious blend of white with a tad of green/cyan. This snapshot of Rosemary and Ale has become an icon for us. It represents a time when we took chances, saw an uncertain but decidedly rosy future and our children were many years from being older now, than Rosemary and I were then. The picture of Ale on the beach I took on the Gulf of California somewhere near a place called Bahía Kino. When we visit Ale in Lillooet I sometimes feel a comforting feeling. I think it could be whiffs of the dessert, of that lovely Gran Desierto de Altar and how one can sometimes partially go back home again. I was walking on 43d Avenue and within sight of my house on Athlone, when I spotted white stuff on my boulevard lawn. I immediately thought of the children from the nearby elementary school who have a habit of throwing the remnants of their lunch on the way home. When I was close I knew I was wrong. I was most pleasantly surprised. A recent wind must have blown off a large swath of the peeling bark of my Betula utilis var. jacquemontii or Himalayan Birch. Any tree as beautiful as this one should require (in my books) a mouthful to pranounce. I first spotted this white ghost (a grove of them) at VanDusen Botanical Garden one late February some 17 years ago. Both Rosemary and I knew we would plant one in our garden. Our specimen has grown quickly and is almost as big as the VanDusen ones. It is a sentinel of my winter garden. Even though I am not an American this tree reminds me (as well as the VanDusen specimens) of Confederate soldiers wearing their bleached grays, standing their ground in spite of an inevitable defeat. The two panoramic pictures I took in February 1992 when Rosemary said, "Let's go for a walk in VanDusen." I replied, "You must be crazy. What can we see that is of possible interest?" Of course She was right. In my own small way I contributed by bringing along that swivel lensed Widelux loaded with Kodak Infrared film. The other two images are scans of the bark I found yesterday. The green comes from the grass that the bark has been on for perhaps a few days or weeks. The brown colour is on the inside. 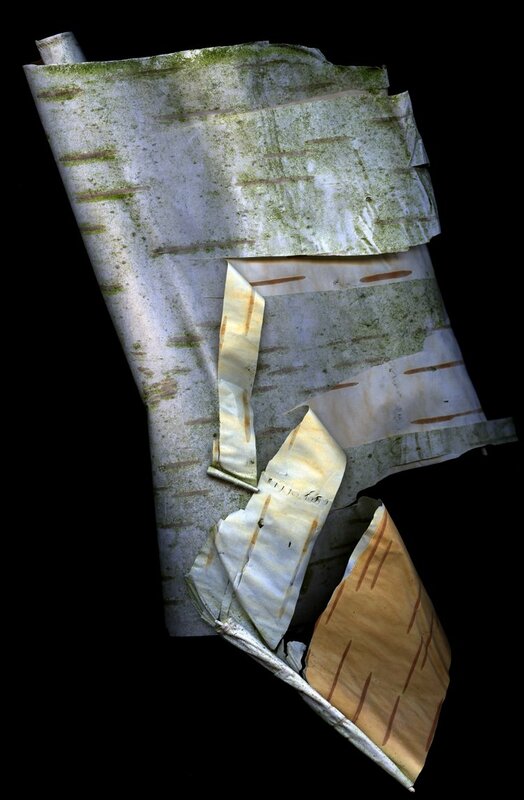 This image I scanned from the bottom, placing the bark on the flatbed scanner. The second image is a double scan. 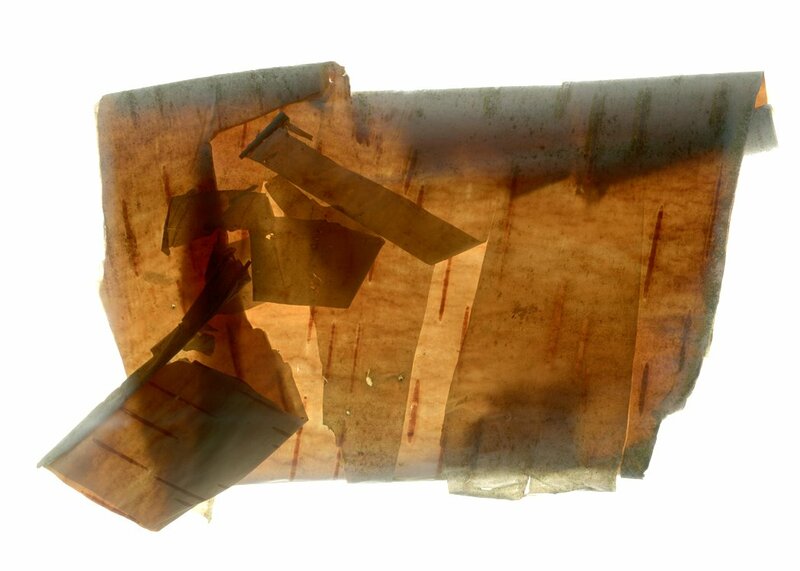 I treated the bark as a transparency and my scanner passed on both the top and bottom simultaneously. All my life I have been surrounded by women even though I never had a sister. I almost had a little red haired sister but she was born dead. When I was 10, my father left home and left me to the mercy of my mother and grandmother. When I saw my father again in 1965 his first question to me after looking at me with an affection I had missed for so many years was, "How is the old battle ax?" He meant my grandmother, of course. He asked with a smile as he had always liked my grandmother. I think my father loved women, just like me. Only a couple of days ago at our wedding anniversary dinner at a restaurant I beckoned at Lauren (6) to sit on my lap. Her hair smelled of fresh Granny Smith apple. I made a point to not only enjoy it but to mention it. Her father, Bruce Stewart, said, "I washed her hair this morning." Rebecca (11) asked me, "Papi why do you smell the hair of little girls?" I told her that not only did I smell the hair of women when I could but, like my mother, I also like to smell behind the ears. My mother used to do that all the time. With perhaps a complete ignorance of Inuit customs she would explain to me when I would ask her (just like Rebecca asked on Sunday night), "Alex Eskimos don't know how to kiss. They like to rub noses and get pleasure from smelling each other." My mother, after smelling me behind my ears often told me I had the exquisite scent of an English gentleman. To this day one of my fondest pleasures is to breathe deeply behind Rosemary's ear (and the other one, too If I have a chance). I don't think that Rebecca quite understands this pleasure yet. There seems to be much less emphasis these days to the pleasures of scent. There are arts that cater to the eyes and the ears. Even some sculptures beg us to use our sense of touch. But I don't know of any that directly cater to our noses except as an ancillary approach to the art of cuisine (with the further ancillary art of wine sniffing). Rebecca should know better considering that she can identify at least 10 roses in my garden (with her eyes closed) by scent alone. The only scent of a man that I have any memory of is that of my father who used to smell of clean soap laced with an attractive aroma (at least it was then and in my head now) his cigarettes which came in metal tins that read Player's Navy Cut Tobacco. I like girls and I like girls that smell nice. My mother used to use Chanel No.5. Few use it now but when I get a whiff of it here and there I always think of my mother. For many years I used to buy Hermes Caleche for Rosemary every time I flew on Japan Airlines to Mexico. They had that delightful perfume in their in-flight catalogue store. But it has been at least 20 years now that both Rosemary and I don't use perfume or any lotions. She insists on unscented deodorant. To me a woman who wears a good perfume (I wonder why I didn't remember to tell Rebecca that any woman knows you dab perfume behind your ears!) is doubly a woman. One of the most elegantly feminine women I know is my younger daughter Hilary Stewart. There is a special reason why Hilary is so feminine and elegant. This is because anytime I see her and watch her crooked smile (my crooked smile) I know it came through me from my mother. That smile of Hilary's is the smile of my mother. She inherited, not only that smile but an elegance and grace that my mother had in spades. Taking Hilary to a concert (especially when she dresses up and puts on perfume) is exhilerating. Hilary, quite here and now, as she sits by me with that smile on her face as we listen to the music, is also a ghost. 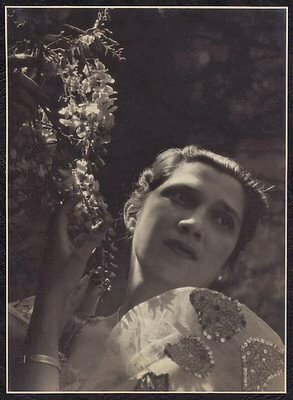 She is my mother's ghost- a most beautiful and elegant ghost inside the living flesh of my daughter Hilary. 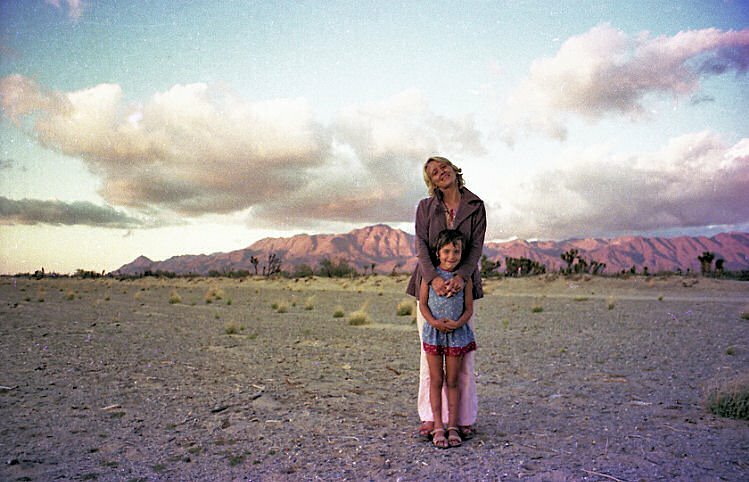 In 1971 with the help of my mother, Rosemary and I bought a little house in the outskirts of Mexico City in the State of Mexico. It was called Arboledas and our house was half a block from Los Bebedores. This was a boulevard of huge eucaliptus trees that ended at a tall white concrete wall. Under it were two parallel rectangular pools where the animals that had once grazed in those parts could have had a drink, hence the name bebedoros or "drinking pools". At the time we had only one daughter, she was 3 and her name was Alexandra. Our Mexican neighbours thought that was much too so they called her Ale (pronounced Ah with the le of let). One day our housekeeper came to me, "Señor hay un problema con Ale!" She was on the floor of the kitchen. She looked dead. One of the cabinets was open and I spotted a bottle of Carbona (carbon tetrachloride) an upholstery spot remover. I immediately called our pediatrician who told me to rush her to hospital after inducing vomiting. Something just didn't sound right. I had been a Boy Scout in my youth and I remember that for some poisons, vomiting could make a situation worse if the poison happened to be corrosive. I rushed Ale to the bathtub and poured cold water on her face. Her eye balls were turned up but the cold water brought some life to her. A neighbourhood acquaintance, a singer called Piruli took me in his car (and calmed me down) to the local doctor just a few blocks away. The kindly doctor immediately came out with a stomach pump and asked me if I had induced vomiting. I nodded to the contrary and he smiled. After Ale was revived he calmly told me, "She would not have made it to the hospital." A couple of year later our housekeeper Clemen and Ale went for a walk on the Bebederos. Ale decided to pull a wild flower. A nearby little girl shouted, "Don't touch my flowers and threw a large chunk of brick which hit Ale on her forehead. There was lots of bleeding. When I saw Ale I almost fainted (I don't like the sight of blood.) I took Ale to our friend Carlos Zamora's house who made some curious little bandaids with scissors and white adhesive tape. He used them to bring the edges of the gash together. And that was that. Ale has always been a happy girl but in moderation. 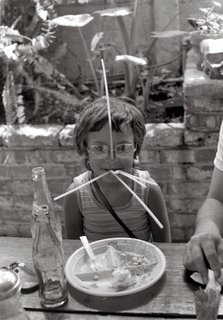 Had she been born in the 50s she would have been a hippie. There is a streak of melancholy in her face, behind her smile, that almost breaks my heart. I sometimes wonder if her two near-death experiences made her grow up quickly. I know that Ale is wise beyond her keen intelligence. She is one of those terrible persons who can coast and do extremely well without really trying. She can read a book upside down as fast as I can read a book normally. As Rosemary and I file all these old pictures and yesterday and we celebrated our 41st wedding anniversary (that always makes me think) I thought that my mother died when I was 30. I find it amazing (more than my wedding anniversary) that my sad looking Ale, So beautiful, so elegant, is 40. 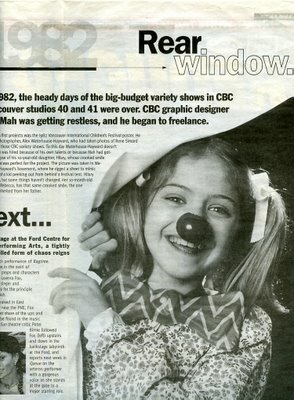 In 1982, the heady days of the big-budget variety shows in the CBC Vancouver Studios 40 and 41 were over. 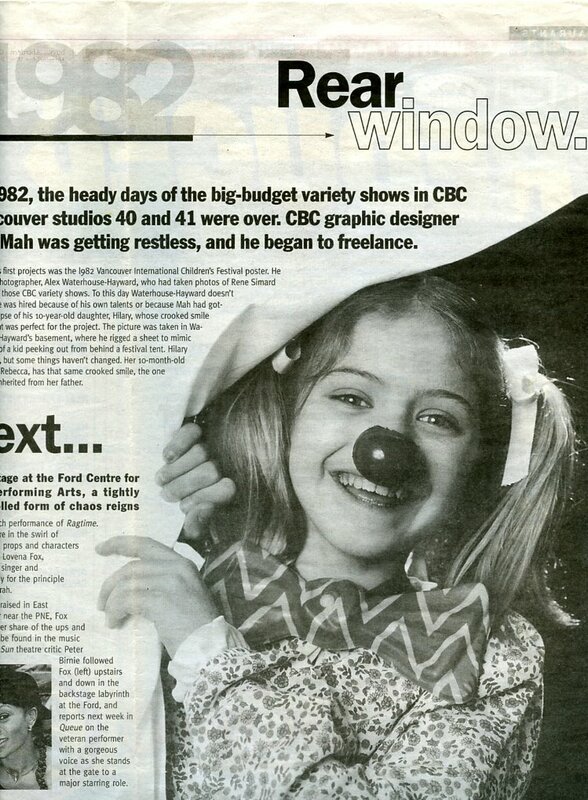 CBC graphic designer Ray Mah was getting restless, and he began to freelance. 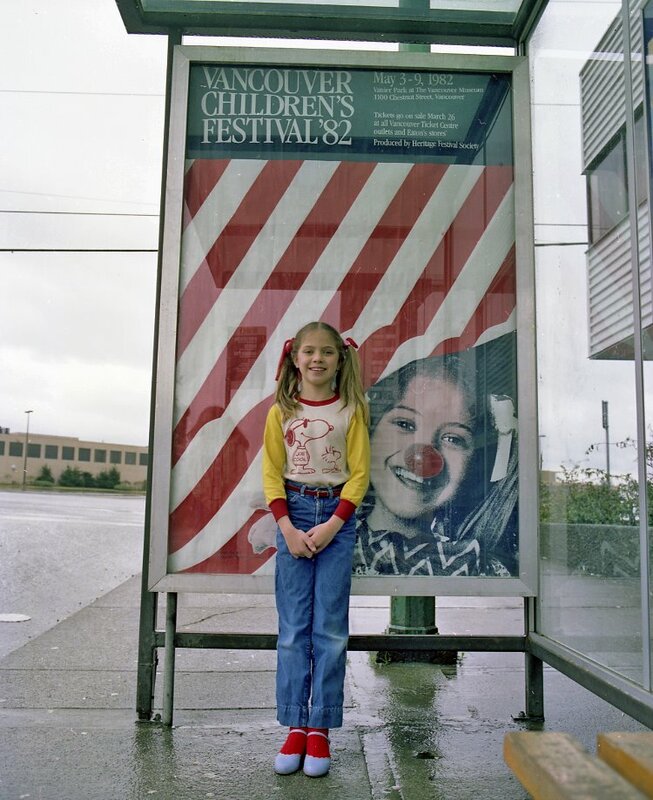 One of his first projects was the 1982 Vancouver International Children's Festival. He called a photographer, Alex Waterhouse-Hayward, who had taken photos of Rene Simard for one of those CBC variety shows. To this day Waterhouse-Hayward doesn't know if he was hired because of his own talents or because Mah had gotten a glimpse of his 10-year-old daughter, whose crooked smile he thought was perfect for the project. 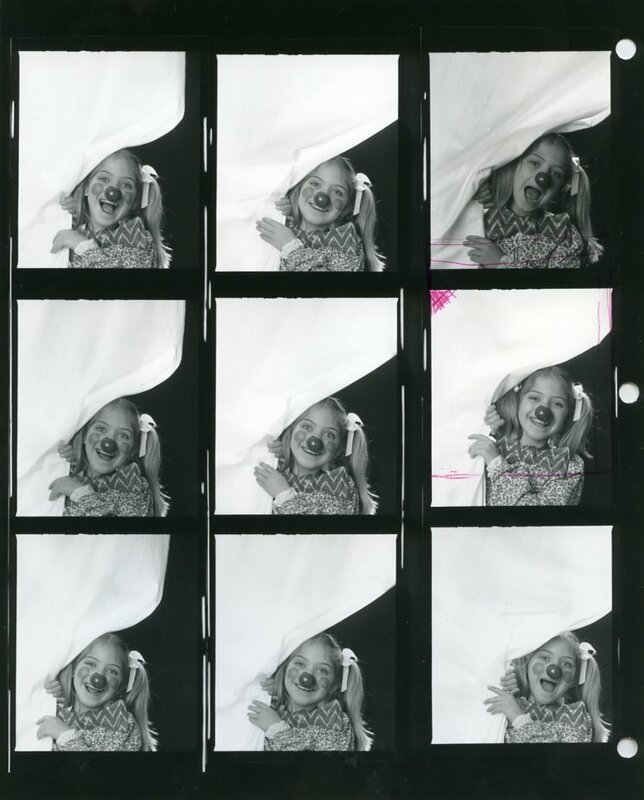 The picture was taken in Waterhouse-Hayward’s basement, where he rigged a sheet to mimic the folds of a kid peeking out from behind a festival tent. Hilary is now 26, but some things haven't changed. Her 10-month-old daughter Rebecca, has the same crooked smile, the one she inherited from her grandfather. 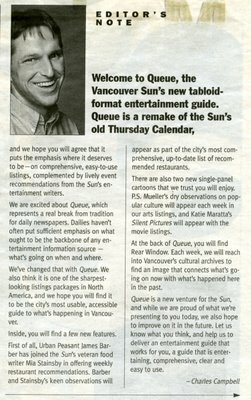 To this I can only add that I miss the fact that so many events from our Vancouver past are now so sadly forgotten and few publications go beyond a rosy nostalgia without the perspicacity of Campbell's knowledge that the past has meaning when interpreted with the present. 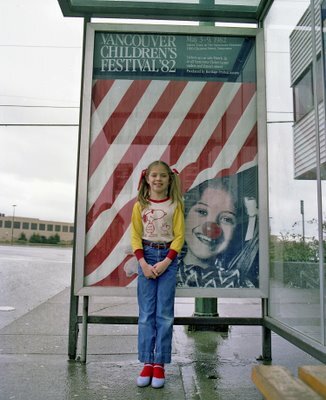 I took the first picture of Hilary here at a bus stop on Willingdon in Burnaby and very close to Lougheed Highway. 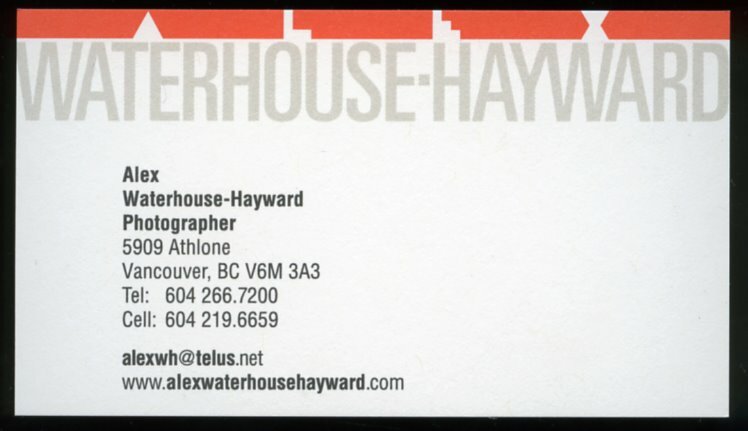 Ray May is still restless and would perhaps want to re-design my business card which he designed sometime in 1982. When he broaches the subject I tell him that his design was so timeless that even today when I produce my card people ask.